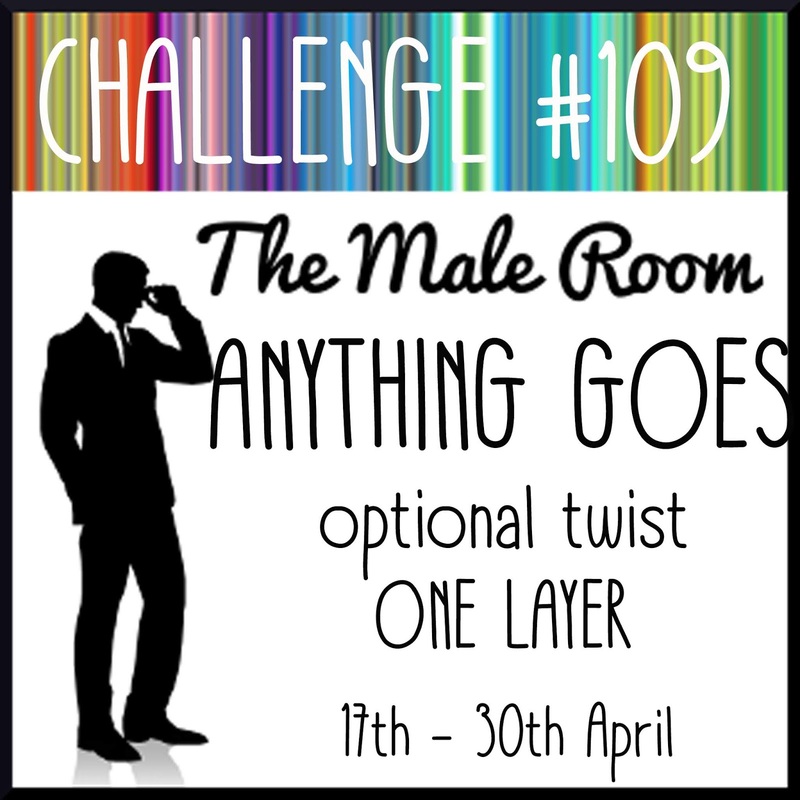 am sending love today for the new challenge at The Male Room challenge where we have a anything goes challenge starting today with an optional twist of a no layer-project. 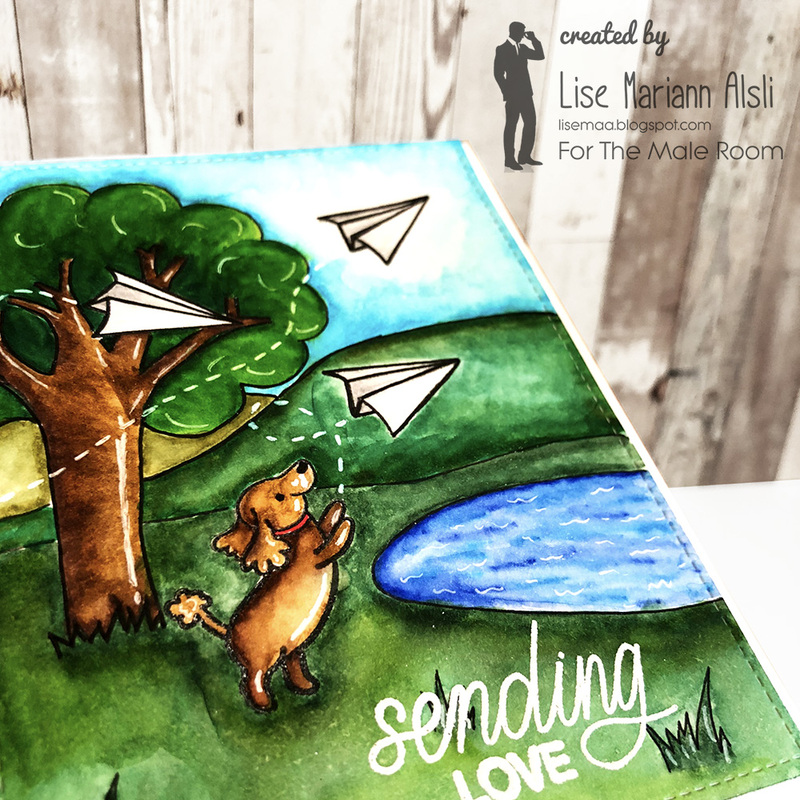 For my design team project I decided to make this scene using the "Yappy, happy mail" stamp set by Heffy Doodle as a start and then by drawing a scenery around the cute dog and his paper planes. 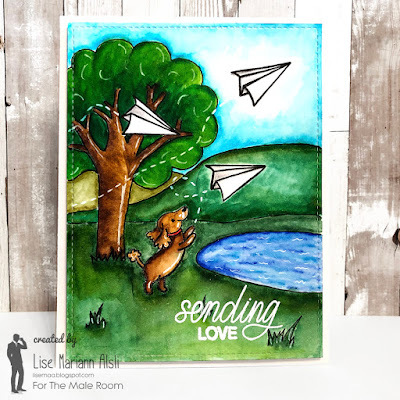 I started stamping and drawing the scene and then I used the Zig clean color real brushes and a water brush to color everything in. I used a white gel pen to create highlights and flying trails for the paper planes. When the scene was all colored I cut it to size by using a stitched rectangle die by Lawn Fawn. I decided that it needed a bit of white to lighten the scene so I stamped the sentiment (also from the "Yappy, happy mail" stamp set) and then embossed it in white embossing powder. To finish the card I mounted it on a white card base. 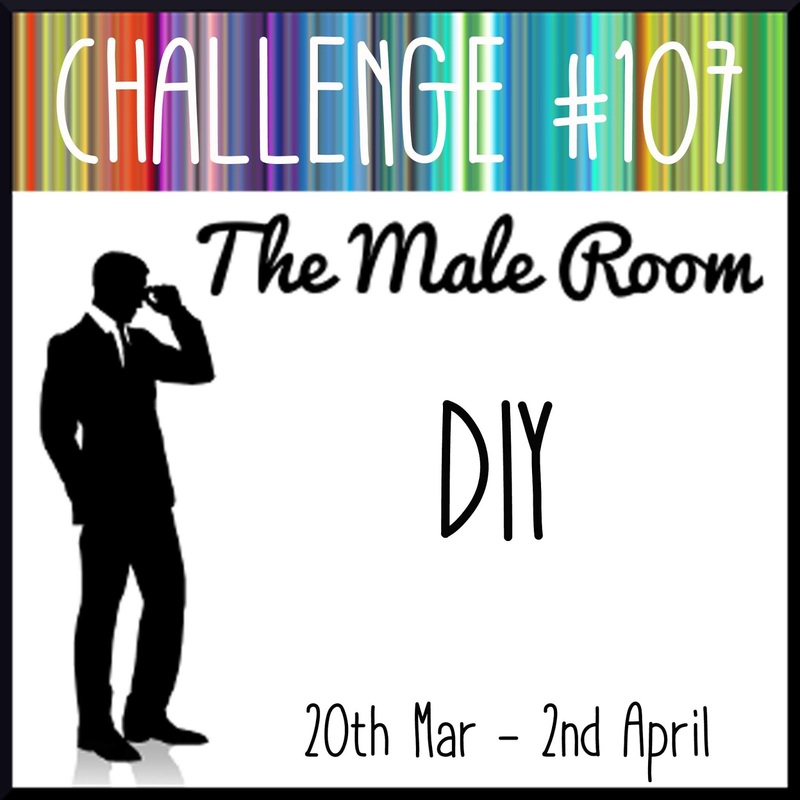 I hope you will join us in our new challenge at The Male Room. 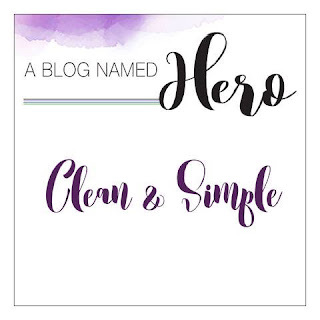 It's time for a new and exciting challenge at A Blog Named Hero. The next month we are doing Clean and simple projects. Below you can see my first Clean and simple card this month. 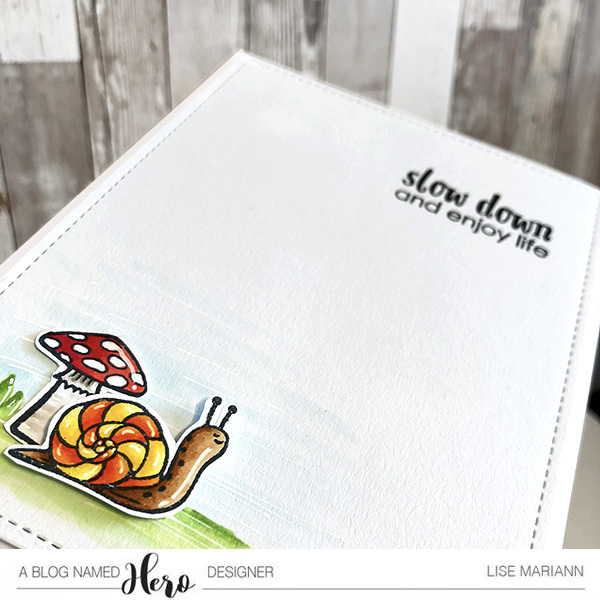 The card is a white panel on a white cardbase using a few images from the "Pet turtle" stamp set by Hero Arts. I started the process, as always, stamping the images and coloring them. For this card I used copic markers for the coloring and a white gel pen for the highlights. I also covered the hat of the mushroom and the house of the snail with wink of stella brush pen. 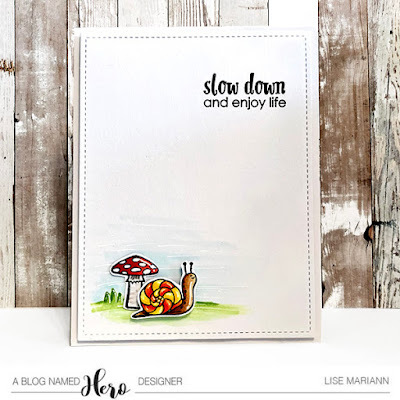 I cut the white panel to size using a stitched rectangle die from Lawn Fawn and colored a quick and cartoonish grassy hill and blue sky also using copic markers and a white gel pen in which I placed my mushroom and snail images. I then stamped the sentiment also from the "Pet turtle" stamp set. To finish the card I popped the white panel up on a white card base using foam tape and called the card done. I hope you will make lots of CAS cards with us the next month. See you soon. 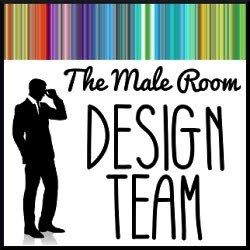 It's my first day at The A Blog Named Hero design team today and I'm jumping through the roof of plain excitement. 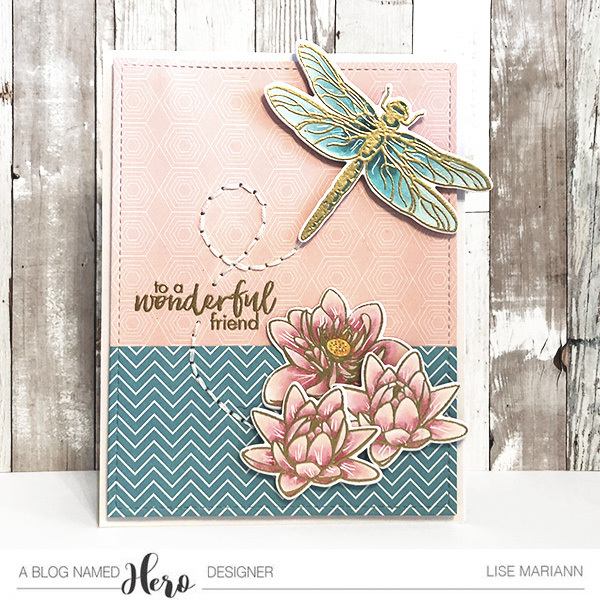 For my first card on the design team I decided to make this dragonfly friend card. I love how it turned out with the gold embossing and the stitching and the lovely colors. For the background I used patterned papers from my stash to suggest water and sky and cut them to size with a stitched rectangle die. I attatched the water lilies in layers raising the top one up using foam tape. I also glued the dragonfly using foam tape. 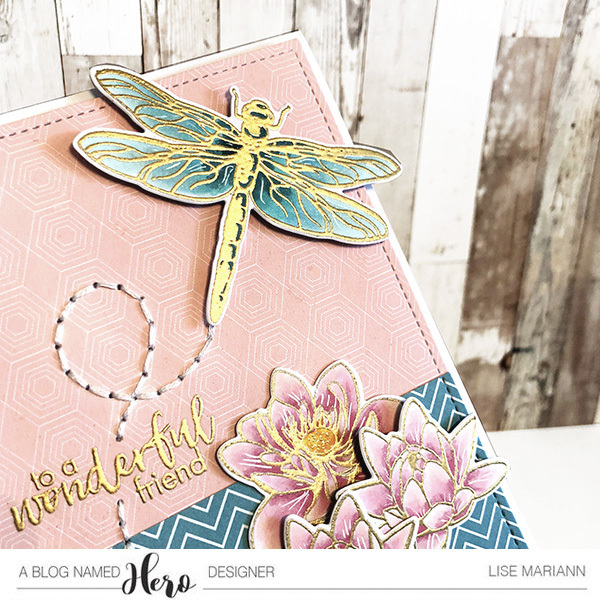 I wanted to have the dragonfly "flying" off the page to create some extra movement in the card. 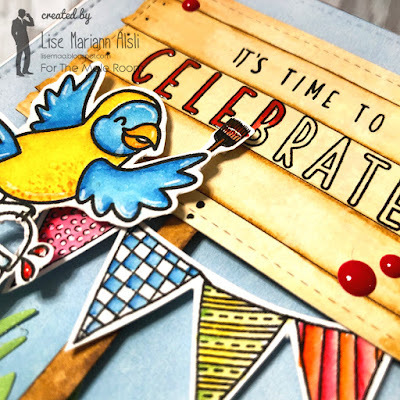 The embossing challenge is now over, but I hope you will have a look at the A Blog Named Hero blog very soon to see who the winners of all the lovely entries are. 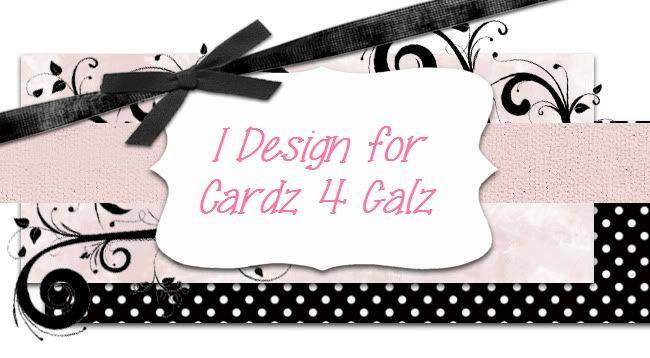 It's time for my last challenge for the Cardz 4 Galz design team. I have loved being a part of the team, but it's time to move on and explore other parts of the creative internet. 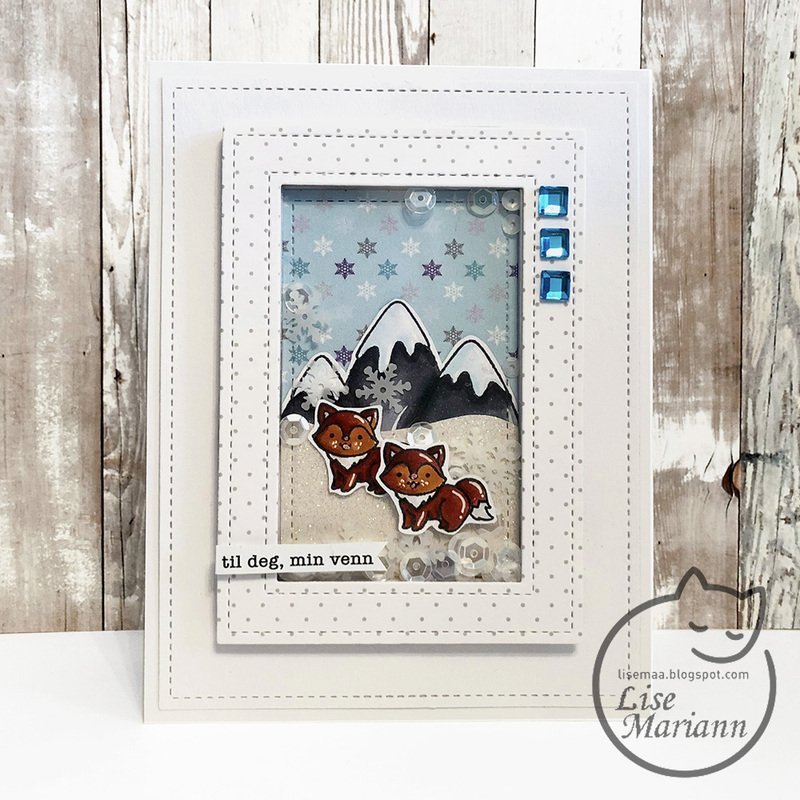 The next couple of weeks we are making cards using two or more patterned papers and this is my result. For my last project I made this cute shaker card using elements from the december 2018 scrapping for less card kit. 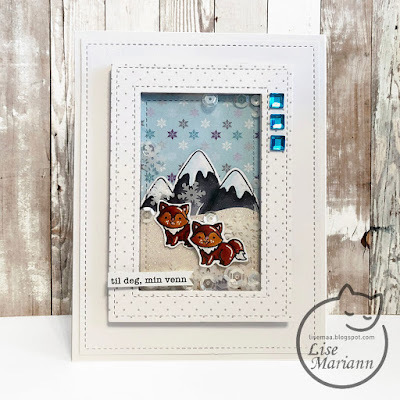 The cute foxes and the mountain is stamped using the "Winter pals" stamp set by Pink and main made exclusively for Scrapping for less. I colored the images using my copic markers. For the inside of the shaker I used papers from Pink and maine and the white sequins and snow flakes from the same kit as the rest of the card. I also made a glittering snowy grouns from white glitter paper by Simon says stamp. I cut the frame around the shaker using Lawn Fawn rectangle dies and attatched three blue gems on the top right of the shaker. The paper for the frame as well as the sentiment strip is from a goodie bag I got on a crop I attended this weekend so i have no idea who made those unfortunately. I cut a white rectangle using a stitched rectangle die for the shaker to sit on and then mounted the whole thing on a white card base. Very cute and very fun to make. I hope you will join us in making patterned paper goodness. Further below you can find a video where I show the process of making the first three cards using this kit. 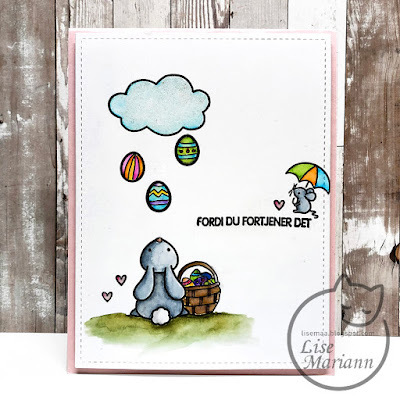 To make this card I used the chickensa dn eggs from the stamp set in the kit; "Spring friends". I also used the flower image from the "Spring motifs" stamp set that you also can buy at Skull and cross buns. I colored all the images using my copic markers and highlighted them using a white gel pen. 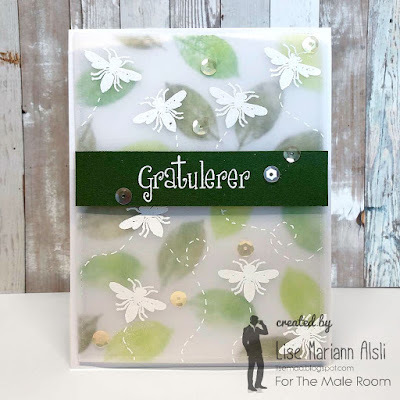 I made the background using a white piece of cardstock that I glued a piece of the striped patterned paper from the kit and a green stripe of cardstock from my stash to. i then cut the panel to size using a stitched rectangle die. I placed the images to the panel and tied the multicolored string around the whole thing before I stamped the sentiment beside the images. I then glued the panel to the yellow card base from the kit using foam tape. 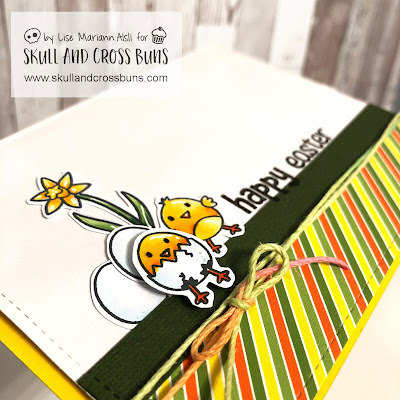 See my three projects using the "Spring friends" card kit in the video below. There is is spring in the air...even in Norway. The snow is still here, but the sun warms our faces when we go out and in some parts of the city the snow is almost gone. It makes me so happy to think about all the lovely months ahead of us. And speaking about happy days, I am happy to show you a spring card made for The Male Room's new challenge. The next weeks we are bathing ourselves in the spring feeling. I glued them down in different heights using both liquid glue and foam tape on a card panel cut to size using a stitched rectangle die. I colored a light grey shadow beneith the images to ground them also using a copic marker. 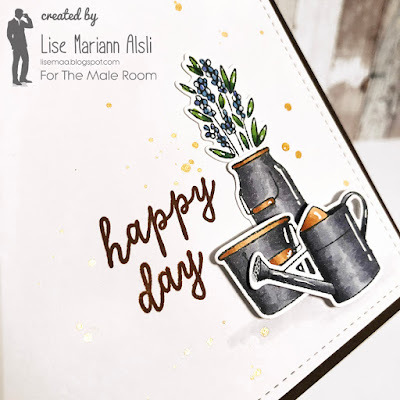 I stamped a sentiment from the same stamp set using vintage photo distress oxcide ink before making small droplets of gold Heidi Swapp color shine. 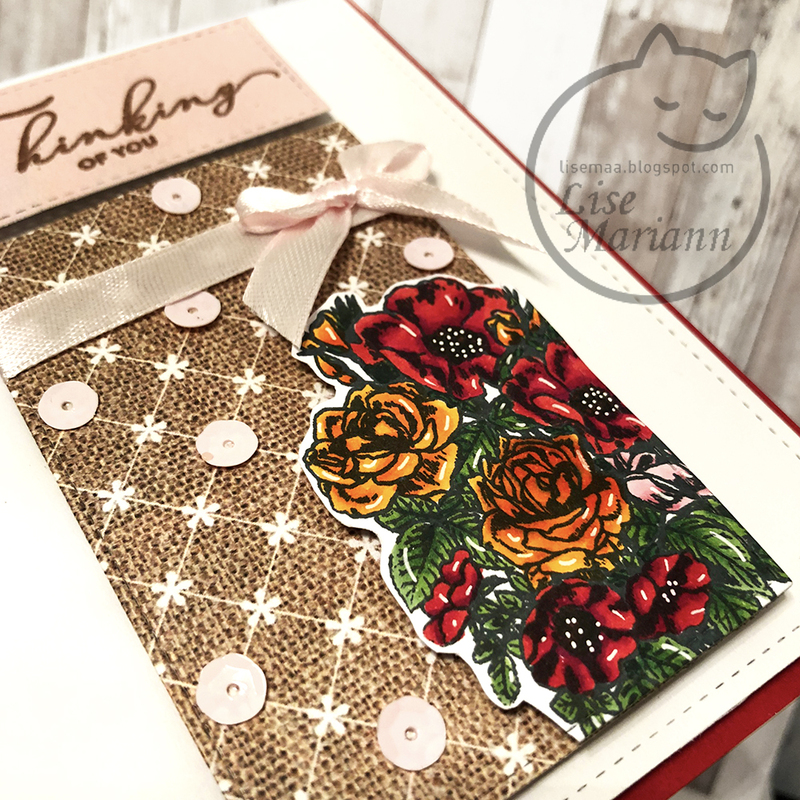 I finished the card by glueing the card panel on the dark brown card base. Please follow this link to celebrate spring with us. A while ago I applied for a spot on A Blog Named Hero's design team because I love... No, I LOVE Hero Arts products. I applied mostly for the heck of it, never believing I would be one of the lucky ones getting a spot. Imagine my surprise and happy squeels and dancing around when I got an e-mail informing me that I will indeed be on the A Blog named hero DT the next year! Wow! I can't wait to start and while I am waiting I am sharing this photo collage of a few of my favourite Hero Arts cards so far. At Cardz 4 Galz we are bringing our floral and/or fauna on in our new challenge. I hope you will join us. I also highlighted the image using a white gel pen. I cut two pieces of the burlap and pink patterned papers by using two stitched rectangle dies and mounted the fussycut image on the burlap one using foam squares. I tied a pink ribbon around the top bart of the panel and glued on a cute bow at the right. 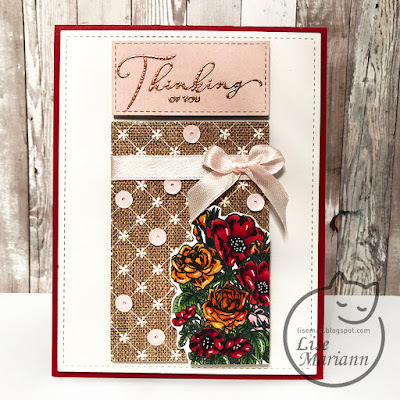 Then I stamped the sentiment from the "Sketched flowers" stamp set by Simon Says Stamp and embossed it using copper embossing powder by Hero Arts on the pink panel. So shiny! I cut another stitched panel out of white cardstock and mounted my two panels on this using even more foam tape. For the finishing touches I glued on a bunch of pink sequins on some of the white flowers on the burlap paper to add some shine and then glued the whole thing on a red card base. If you want to join us the next couple of weeks head over to Cardz 4 Galz. 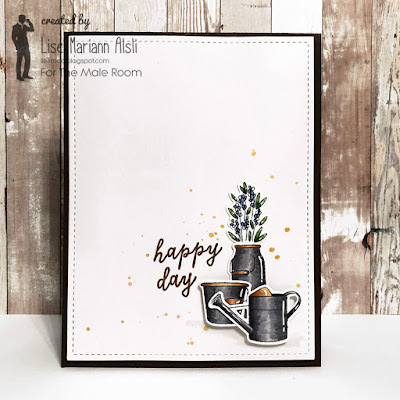 We would love to see your floarl and/or fauna-cards. Hi everyone. 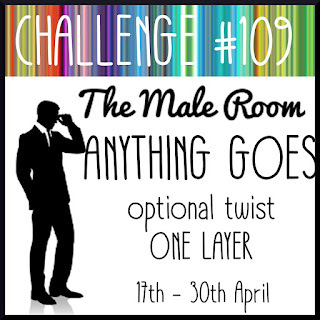 A new day and a new challenge at The Male Room Challenge. For my DT-project this time I made a cute card for a birthday boy I know. I started making my background panel using a stitched rectangle die from Lawn Fawn. I colored it using distress brushes with the distress oxcide colors stormy sky and tumbled glass. 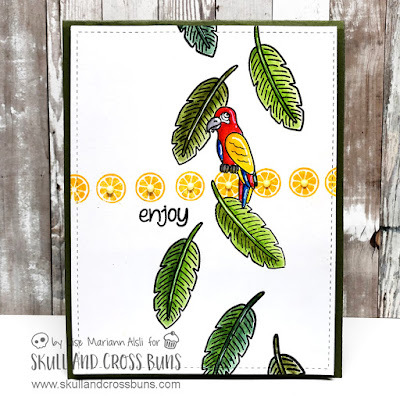 I also colored a piece of cardstock using the distress oxcide colors twisted citron, mowed lawn and lucky clover. 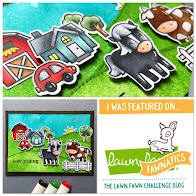 I then cut them using the same rectangle die as the background panel and then a grass die from Lawn Fawn. I glued these pieces together to make the scene for the images. I popped the grass at the top up on foam squares to create dimension. I splashed a couple of drops of water on the grass and sky to create even more dimension in the image. For the sign I cut a piece of white cardstock using a Lawn Fawn stitched rectangle die. I then cut the edges to make it look like boards. I drew lines and nails and then colored the sign using Zig clean color real brush markers. I also cut a strip of paper to make the post for the sign. 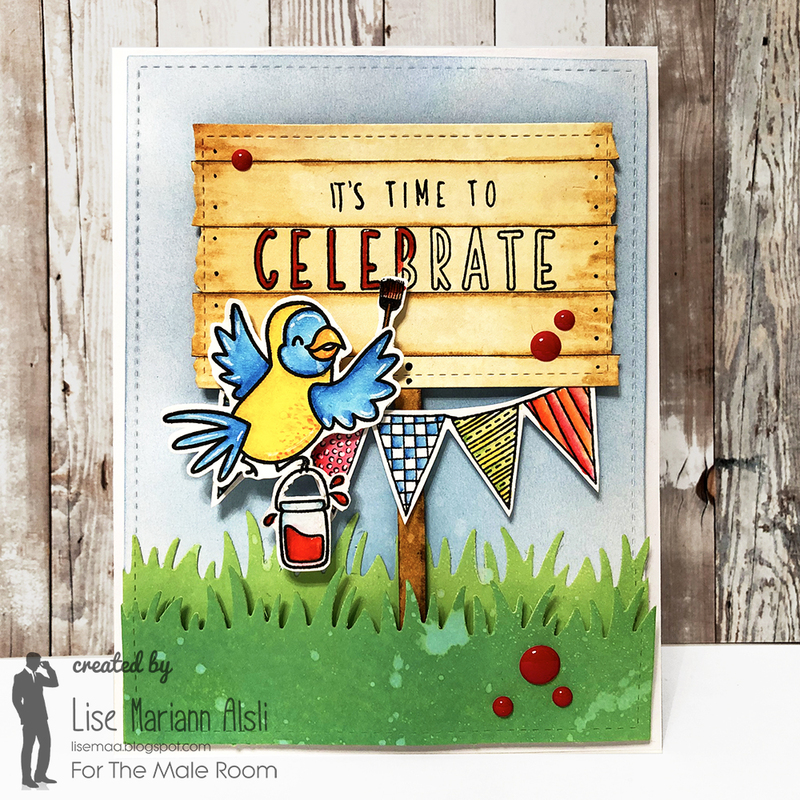 The bird image is from Heffy Doodle's stamp set "Wing man". 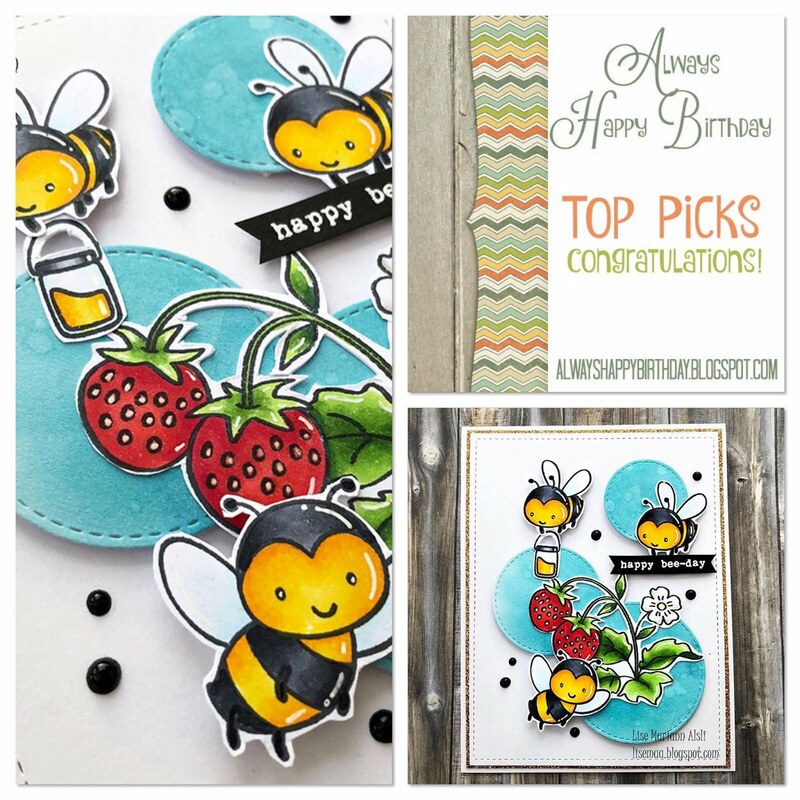 The paint bucket is the honey bucket from the "Bee happy" stamp set by Hello Bluebird. 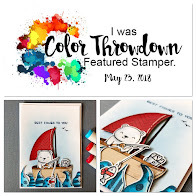 The paint brush is an altered shovel from the stamp set "You & me by the sea" by Hero Arts. The banners are from the Concord & 9th "Birthday stacks" stamp set. The sentiment is also from the same stamp set. I did all of the coloring on the images using my Zigs. I only colored part of the sentiment to make it look like the birs is in the middle of making the sign. I assembled the images popping all the images up on foam squares before I mounted the panel on a white card base using even more foam tape. For finishing touches I glued on a couple of red enamel dots and covered the "paint" on the sign and in the bucket with glossy accents to add some shine to the card. 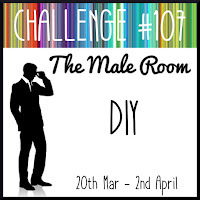 I hope you will join us in the DIY challenge the next couple of weeks. Hrllo. 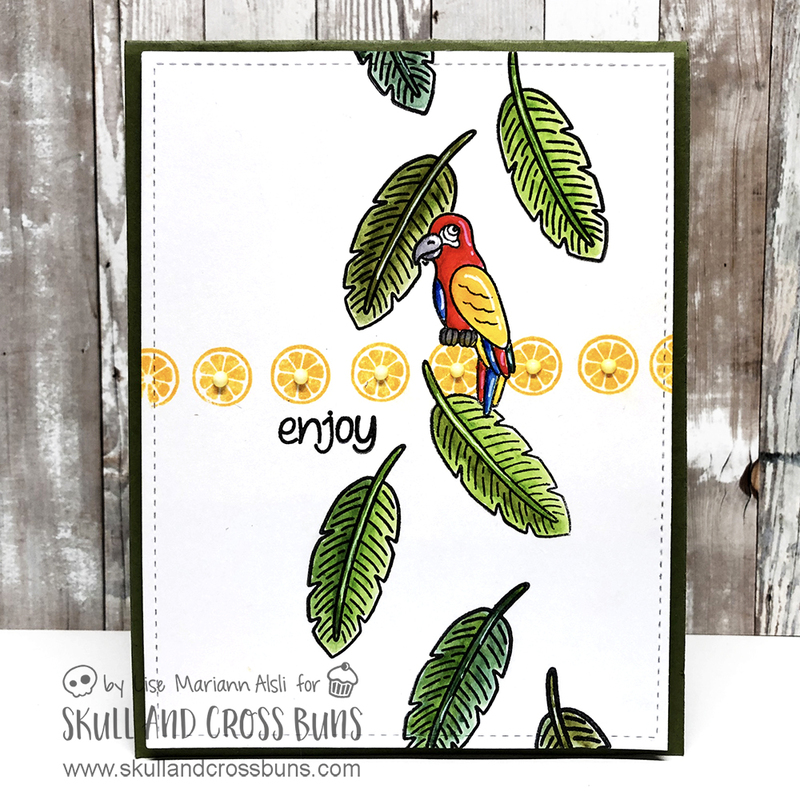 I am sharing a DT-card for Skull and cross buns today using the "Tropical party" stamp set. 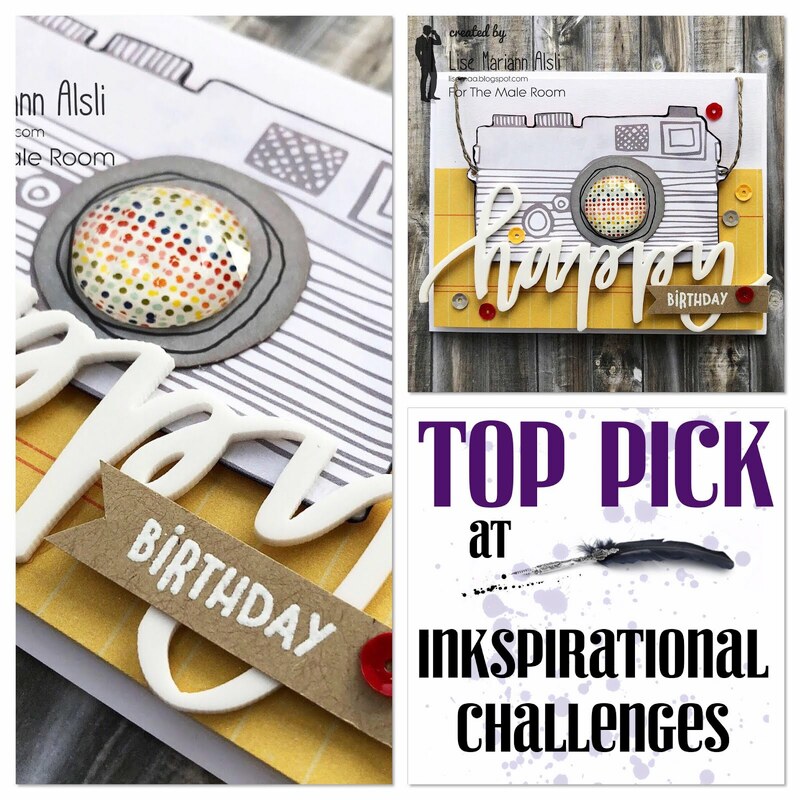 I cut a piece of bristol smooth cardstock using a stitched rectangle die and stamped my images from my chosen stamp set. I created a mask for the parrot to make the falling leafs fall behind him. 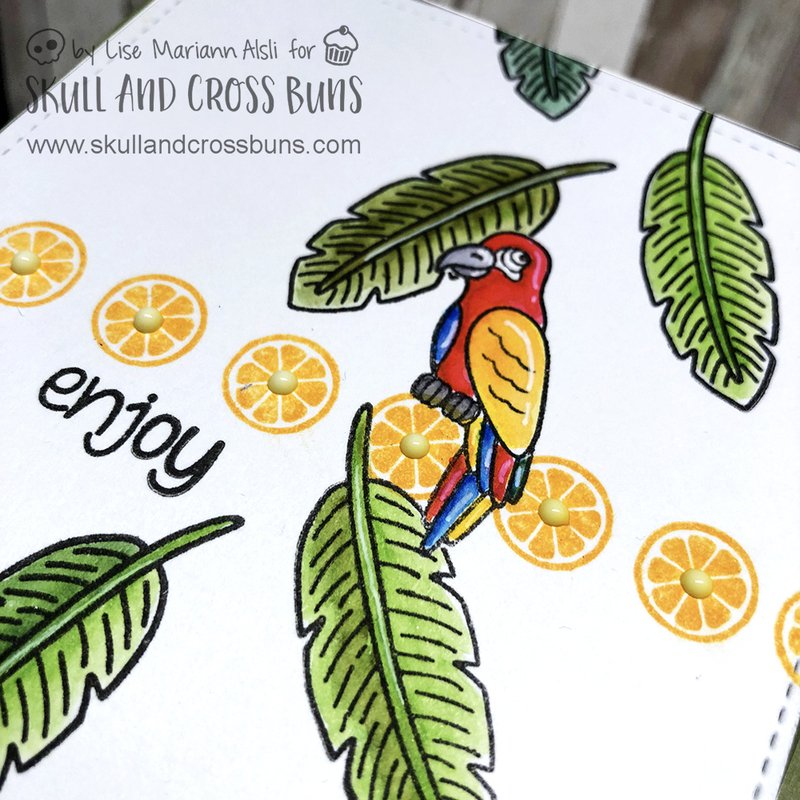 I love the three layers of images (oranges, leafs and parrot) even though the card is flat. I colored my images using Zig markers and a water brush and created some highlights using a white gel pen. To finish the card I dotted Nuvo drops in the middle of each orange slice and then placed my card panel on a green card base using foam tape. It's time for a new card for the Cardz 4 Galz challenge blog again. 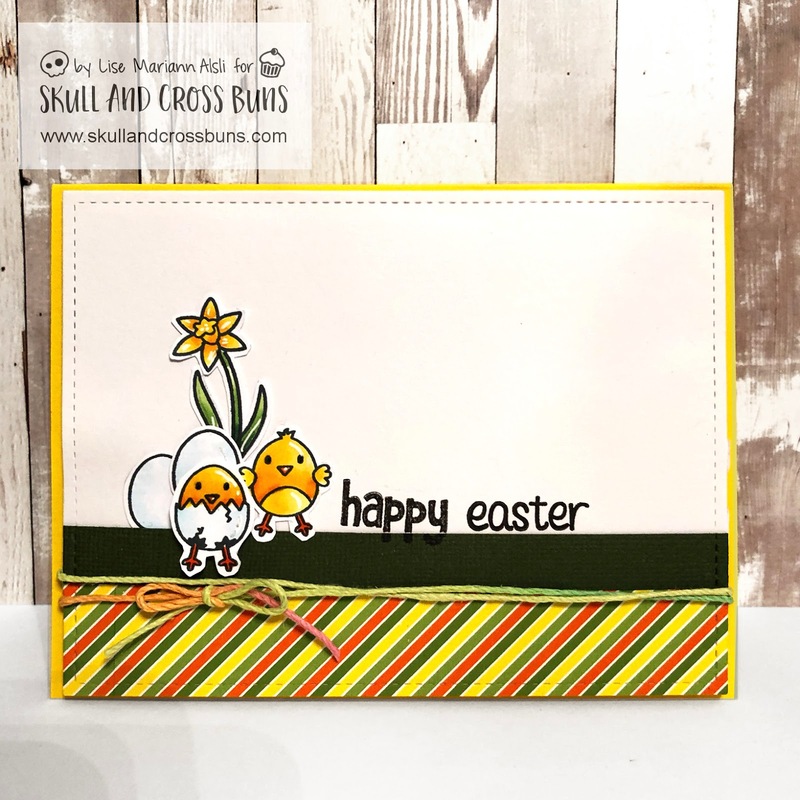 Our theme this time is March hares (or rabbits) so I decided to make this colorful "just because you deserve it-easter card". It's a one layer cardusing several stamp sets and some of my own drawing. First I stamped my images on Bristol smooth cardstock. 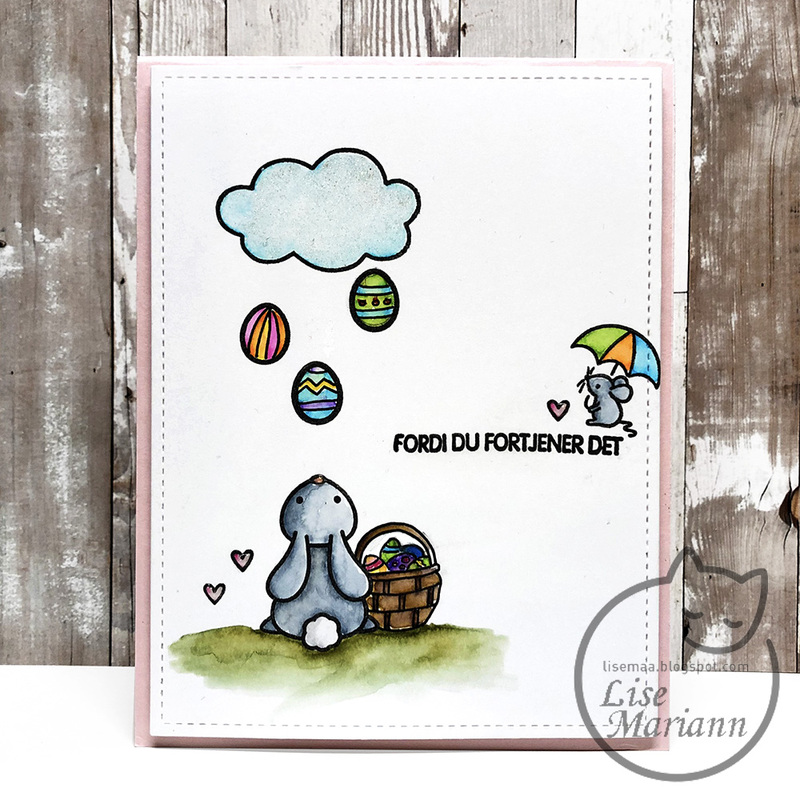 The bunny is from the "upon a star" stamp set and the eggs and little hearts are from the "Baked with love" stamp set. Both sets by lawn fawn. 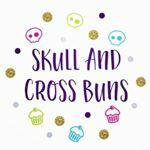 The cloud is by Skull and cross buns. The little mouse and the umbrella is from the "Puddle play" stamp set by Hello Blue Bird stamps. The basket with eggs are handdrawn. 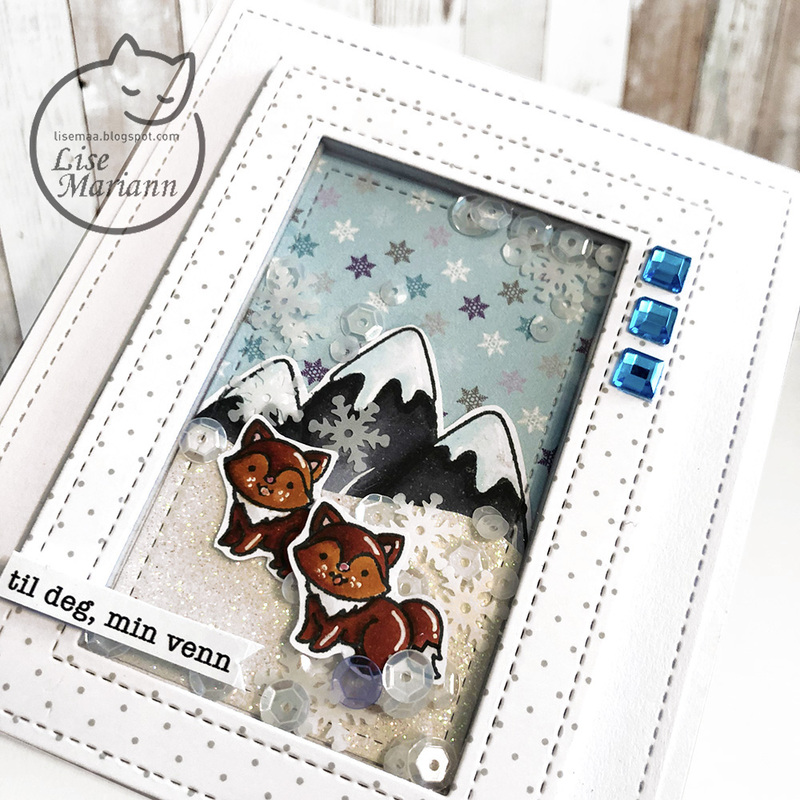 The sentiment is from a sentiment stamp set by Norsk stempelblad and reads "Because you deserve it" in Norwegian. After all the stamping was domne I cut the image to size by using a stitched rectangle die by lawn Fawn. All the coloring is done using my Zig markers and a water brush. I also used my Wink of stella brush to create the glittering cloud, hearts and bunny tail. 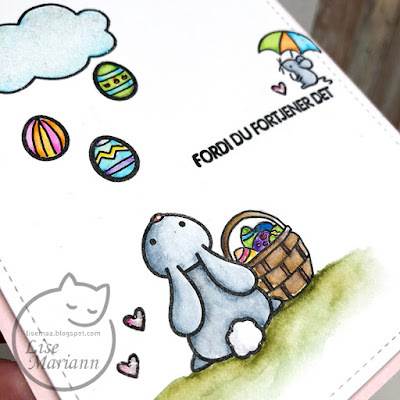 To finish the card I mounted it on a pink card base using foam tape and covered the hearts and the bunny nose with clear accents. 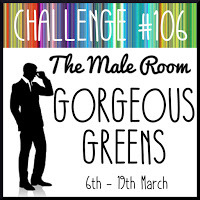 I hope you will join us in our march hare challenge the next couple of weeks. We are celebrating the georgeous greens today at The Male Room Challenge blog and I have made this summery card. 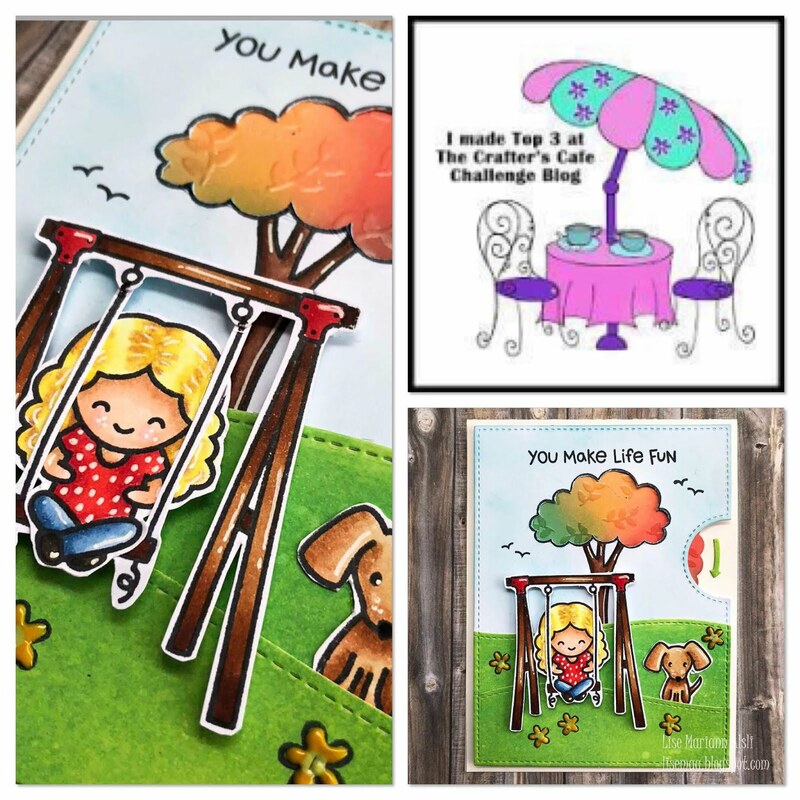 I chose to use a stamp set from Momenta stamps for my images. First I stamped the leaf image in several distress oxside greens on a piece of white cardstock. To dull them down a bit I decided to cut vellum to size using a Lan Fawn stitched rectangle die. To enhance the dimension the vellum creates I white embossed lots of wasps (I don't really like wasps, but white ones on paper is ok...) on the vellum and popped the vellum up on foam squares before glueing it on top of the leaf stamped panel. I white embossed a sentiment from Norsk stempelblad on a green strip of cardstock. The sentiment reads "congratulations" in Norwegian. 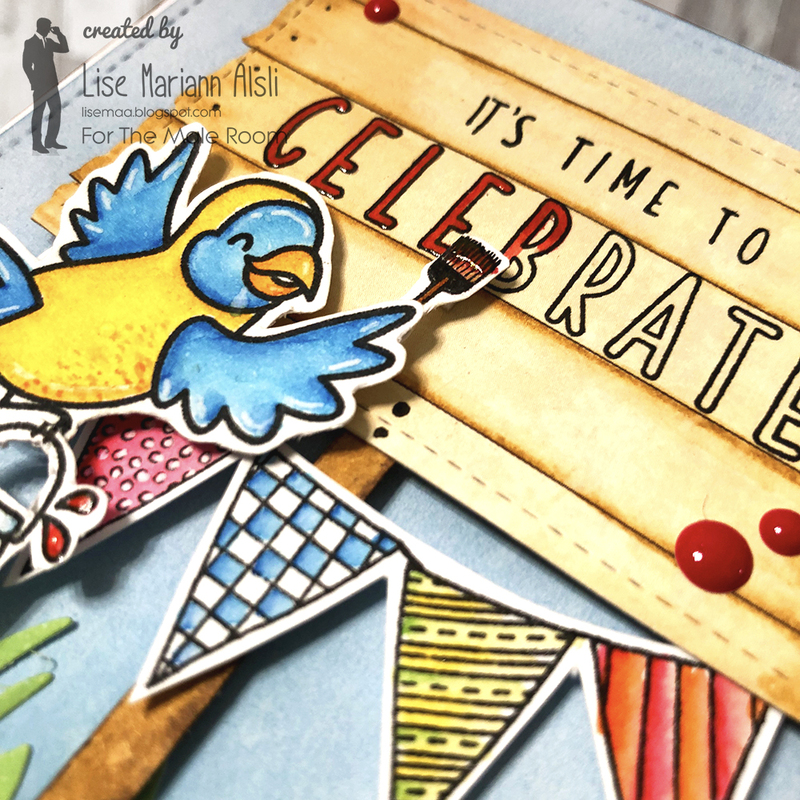 I popped the sentiment strip up on foam as well and attatched it on the card. For finishing touches I attatched some light gold sequins and drew flying trails using a white gel pen all across the front of the card. I then glued the whole thing on to a white card base. I hope you will join us celebrating the greens.